As a child, Andrew Stoltmann ’94 witnessed the cruel effects of fiscal crime when his father was swindled in a real estate deal, losing $80,000. 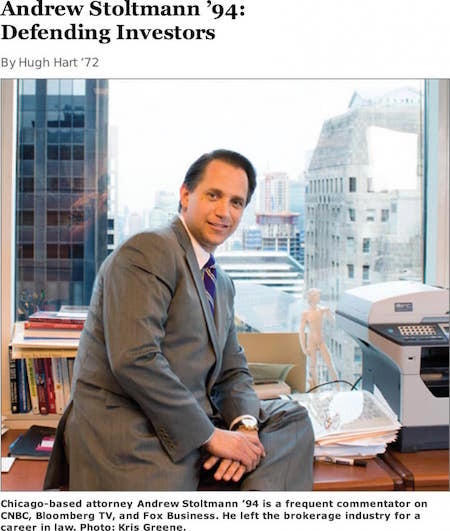 That experience motivated Stoltmann to spend his career exacting his own form of payback in the courtroom, going after brokerage firms that he believes have defrauded clients. A frequent commentator on Bloomberg T V, CNBC, and Fox Business, the attorney is now zealous about his chosen mission, but he was intent on a career in business when he enrolled at UW–Madison. As an undergraduate, Stoltmann also joined the speech team and picked up rhetorical skills that later proved invaluable in the courtroom. “I learned how to put an argument together in my head and to speak persuasively, without notes,” he says. After graduation, Stoltmann began work at a Milwaukee brokerage firm. He imagined himself conscientiously analyzing business stocks that would deliver honest profits for clients, but ended up spending his time cold calling to recruit new business. Following what he viewed as an equally demoralizing stint at a similar firm, Stoltmann decided to try to remedy abuses he’d witnessed at the very companies he’d once dreamed of working for. He moved to Chicago and earned a law degree at DePaul University. Stoltmann set out to become an expert at deconstructing risky investments. Eventually, his phone started ringing off the hook as investors sought legal recourse for misleading practices. He says that some 80 percent of his clients are middle-class investors, such as retirees and small-business owners, but 20 percent have substantially higher net worths. “Many wealthy people do get taken advantage of, because they have the larger sums of money,” he says. Of course, some brokers operating in good faith simply pick stocks that don’t work. “Not all investment losses are actionable,” Stoltmann says. To make his legal arguments stick, he needs to satisfy at least one of four criteria to prove that brokers did not have their clients’ best interests at heart. First, investments must be suitable for investors. A relatively high-risk penny stock, Stoltmann explains, is “not suitable for 20 percent of a 70-year-old, retired client’s portfolio.” Excessive trading activity and unauthorized trading are also grounds for legal action. Finally, brokers must not misstate or omit risks associated with investments.